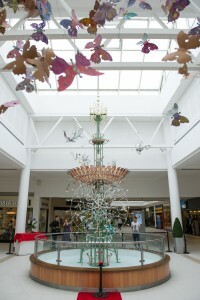 NottinghamLIFE: Jump intu Victoria Centre for in-demand Emett celebrations. Back by popular demand; Emett Clock Week children’s activities have been extended for an extra day at intu Victoria Centre, celebrating the much-loved Emett Clock. Emett Clock Week, which runs from 11 and 17 June celebrates the Nottingham landmark which was lovingly restored by the Rowland Emett Society and intu Victoria Centre last year. As part of the celebrations children at intu Victoria Centre have been decorating Emett-inspired frogs. The free children’s activities have been so popular that intu has extended decorating sessions for one more day this Saturday 18 June. Nigel Wheatley, general manager at intu Victoria Centre, said: “Emett Clock Week aims to bring people together to celebrate our iconic Emett Clock. Due to popular demand we have extended our sessions and we hope everyone gets a chance to decorate their own frog. Art workshops will take place on Saturday 18 June from 11am to 4pm and it is free to take part.